An upcoming meeting on sheep farming will encourage farmers to turn their attention to their ewes as we head into autumn. 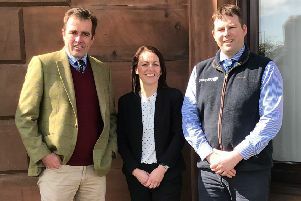 The event, held at Drumtee Farm near Kilmarnock on Wednesday 16 September, by kind permission of the Dykes family, will feature experts from SAC Consulting, SRUC and local veterinary practice Avondale Vets. The meeting will feature discussions on all aspects of pre-tupping and winter management including nutrition, disease, and parasite control. There will also be a demonstration of a ram ‘MOT’, and live fertility testing to ensure rams are fully fit for breeding. There will also be presentations on some key health concerns for sheep; including abortion, OPA (Ovine Pulmonary Adenocarcinoma or Jaagsiekte), which is a contagious lung cancer of sheep, liver fluke and worms – as well as a demo of how electronic identification (EID) can be used on farm to get more accurate measurements and so improve the management of livestock health and performance. This event is free, however for catering purposes those interested in attending should contact SAC Consulting’s Ayr office on 01292 525252. The event is part-funded by Scottish Government as part of its Public Good Veterinary and Advisory Services.